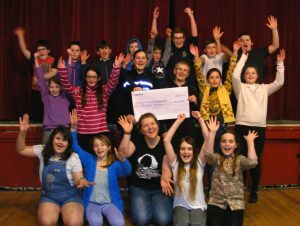 Cumbria’s Police and Crime Commission Peter McCall, recently awarded Gosforth Amateur Dramatic Society (GADS) Youth Theatre £2,000 funding from the Property Fund. The Police and Crime Commissioner has power to distribute funds accumulated in the Property Fund as a result of the disposal of property coming into the possession of the police by the Police (Property) Act 1897 and The Powers of Criminal Courts Act 1973.Speaking about this, Peter McCall said: “I was pleased to be able to award GADS some money from the Property Fund, as I am a great believer in empowering our local communities to proactively help keep Cumbria a safe county. By providing them with the funding, they are giving the youngsters the opportunity to pursue positive, social activities, which in turn will mean they are less likely to get caught up in crime or anti-social behaviour. I look forward to coming along to one of their productions later in the year. For more information about GADS visit the website www.gads.org.uk, Facebook gads1948, Twitter @gadsgosforth or email info@gads.org.uk. Applications to the Property Fund will be considered quarterly, and the next closing date is 31 May 2017. Polmear, with youngsters from the theatre.